RGV FC Toros' midfielder Jesus Enriquez (11) plays against Saint Louis FC a United Soccer League game at H-E-B Park Friday, March 16, 2018, in Hidalgo. EDINBURG — From his earliest days playing soccer, RGV FC Toros midfielder Jesus Enriquez knew he wasn’t fast enough to score through speed alone. Instead, he relies on shiftiness and dribbling, regularly looking to fake out his defender with a step-over or a chip over his head. If neither of those avenues is available, Enriquez said he turns to a simple quick cut, as he did when he scored the USL’s Goal of the Week on May 9 against Fresno FC. Enriquez took possession of the ball on the left wing, motioned like he was heading for the byline and then used the outside of his right foot to cut the ball back toward the middle of the field. He squared up his defender, took one more sharp touch to the right and then curled a rocket of a shot into the upper-right corner of the net. The goal in RGV’s eventual 2-2 draw stands as Enriquez’s only tally of the season. 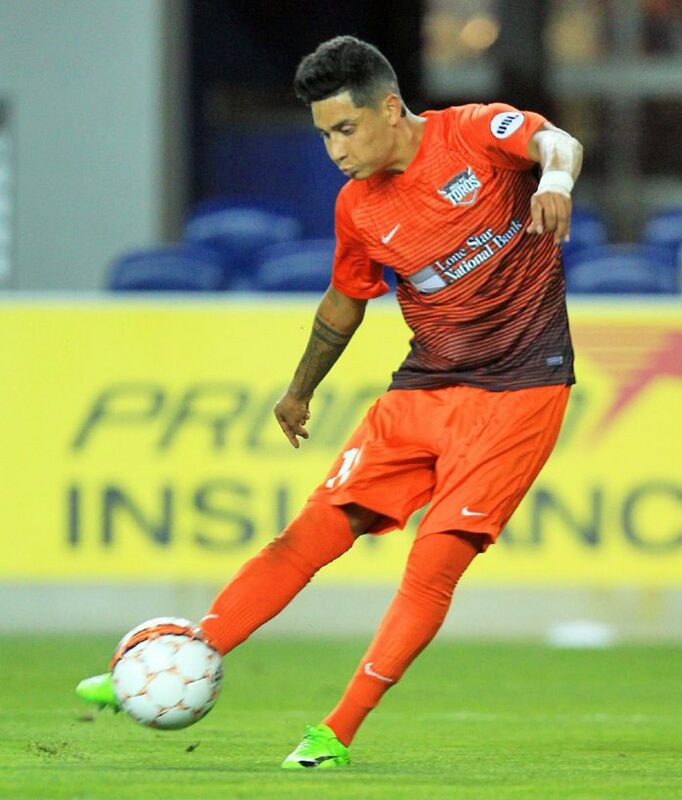 Surrounding that game, the Toros have been held scoreless in their past three home matches, a streak Enriquez hopes to help snap as RGV hosts LA Galaxy II at 7 p.m. Wednesday. As one of the Toros’ standout individual playmakers, Enriquez said he feels a positive pressure to ignite the team’s offense. Enriquez admits that sometimes he draws the ire of coach Gerson Echeverry because of how much he wants to have the ball at his feet in an offense predicated on quick passing. He acknowledges that sometimes his attempts to single-handedly evade defenders lead to mistakes and giveaways. Echeverry said he doesn’t hesitate to voice his displeasure. Echeverry said Enriquez has grown better at listening and fitting into the system — a process the RGV FC coaches have tried to bring about without inhibiting his natural gifts. Instead, the focus is adding to Enriquez’s game so that his dribble moves translate into quality shots and crosses. Enriquez said he knows production is the key to maintaining his freedom of play. “At the end of the day, if it works out that I take a player on and send a cross or take a player on and score, then I don’t think they would tell me anything,” Enriquez said. Echeverry described Enriquez as a “pest” who “infuriates defenders” with his ability to change directions. One of Enriquez’s biggest keys to development is avoiding predictability. Enriquez said his goal against Fresno was a prime example of that progress. He had consistently attacked outside to that point in the game before slicing toward the net on the scoring play. “Definitely that was one of my favorite goals so far in my career,” Enriquez said. The moment was special to Enriquez due to more than just his tactical execution. He grew up in Redwood City, California, which is about a three-hour drive from Fresno, and he said about 50 friends and family members made the trip to see him play against Fresno FC. His mother and father were watching him play a professional match for the first time, as the 20-year-old Enriquez said they never had the proper paperwork to be able to travel to Mexico to see him during his stint with the Club Tijuana B team. Feeling that he wasn’t on track to play at the first-team level with Tijuana, Enriquez asked his agent to search for openings on U.S. rosters. Enriquez signed with RGV FC prior to this season, and he said his focus is on reaching the USL playoffs, hoping it will help propel him to the Dynamo first team and his ultimate dream of playing in the World Cup. His coaches both in Mexico and with RGV FC have told him that the biggest keys to his progression are learning to understand tactics, slow down and read the flow of a match.